George Wilson and Gerry Nellestijn standing behind life-size wooden Salmon. Can you imagine Salmon in the Salmo River? Historically our local River was called the Salmon River and was dominated by Salmon. Our Salmon started life in the Salmo(n) River and tributaries before starting an over 1000 km migration to the ocean. For one to four years they would reap the benefits of oceanic nutrients before returning to their birth streams of Sheep Creek, Clearwater Creek, the upper Salmo River, the South Salmo River, to spawn, die; and to begin the cycle again. The land and all the life around the river benefitted directly and indirectly from the nutrients that Salmon offered. Twice a year First Nations and US Tribes met on the lower Salmo(n) River to harvest over 70,000 lbs of Chinook, Sockeye, Coho, and Steelhead. Salmon were key in First Nations economy, culture, and spiritual ways of life. In 1939, Salmon passage to the Salmo(n) River was blocked with the building of the Grand Coulee Dam on the Columbia River, 200 km south of the Canadian / US border. The loss of Salmon in our watershed did not go unnoticed. The land and its people have lived with this loss for over 75 years. Yet hope remains. Imagine Salmon returning to a land that has longed for their return for over 75 years. Imagine the colour of the Salmo(n) River changing from blue to red. Imagine the overflow of nutrients benefitting our forests, our wildlife and ourselves. If we can imagine, we can make it happen. The Salmo Watershed Streamkeepers Society (SWSS) Imagine Salmon Campaign focuses on increasing awareness, public involvement, and political advocacy. Last summer we put up several ImagineSalmon.com signs throughout Salmo and are looking to expand awareness initiatives to Ymir and throughout our watershed. An associated mural next to the post office can be viewed from the alley as well. 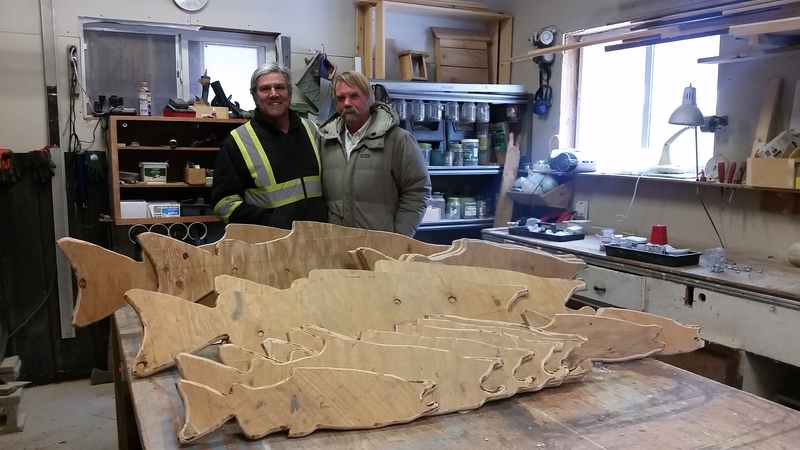 Other involved individuals, like George Wilson (pictured with Gerry Nellestijn), are cutting out wooden Salmon that may be painted by students and installed in various locations to produce three-dimensional “Salmon River Scenes”. SWSS has also created an Imagine Salmon presentation regarding Salmon and the Columbia River Treaty (CRT), which we brought to Nakusp in early December. The Valley Voice published a related article in their December 14, 2017 issue that can be viewed online. In the spring of 2017 the presentation was given at the Salmo Community Centre and now we are looking forward to presenting at the Capitol Theatre in Nelson in 2018. Stay tuned for the date! With each year our imagination and our collective ability to initiate change grows. If you would like to help cut out Salmon (must have a jigsaw tool) or have interest in displaying a “Salmon River Scene” on your property, please contact us via Facebook or phone (250-357-2630). Learn more about SWSS on our website, www.streamkeepers.bc.ca. This entry was posted in News and tagged Imagine, Salmon on February 14, 2018 by swss.